In the immediate aftermath of A.M. Crunchwraps, Taco Bell is expanding its menu once again with a fourth Doritos Locos Taco. 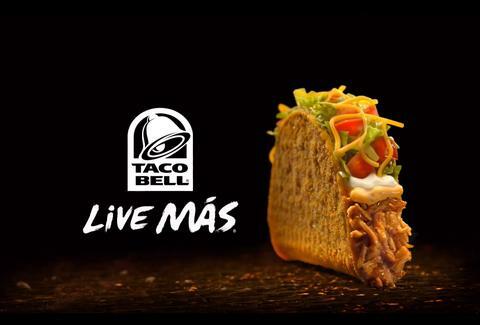 But since Doritos hasn't unveiled its new mystery flavors yet, T-Bell dipped back into the well with another Cool Ranch taco -- only this one's got spicy chicken. Launching nationwide today, the Spicy Chicken Cool Ranch Doritos Locos Taco is meant to be the bolder cousin of the original Cool Ranch DLT, adding hot shredded chicken and new Fiery sauce into the shell. It'll start at $1.59 for a regular and $1.89 for a supreme, but there's also a lower-cal Fresco Style option, since you're definitely eating Taco Bell for the health benefits. Taco Bell is billing this as a limited-run menu item, though considering how many DLTs they've sold (825mill since March 2012), don't be surprised if this guy ends up sticking around. Especially with that Cheetos burrito over at Taco John's nosing in on the Frito-Lay action. Kristin Hunt is a food/drink staff writer for Thrillist, and is currently taking bets on the launch date of the Funyun quesadilla. Follow her at @kristin_hunt.